Joy is a girl who hated social studies until she realized she could learn history through literature thanks to “I Know Why the Caged Bird Sings.” Joy is a girl who put her hands on her hips and smiled in delighted disbelief after mastering frying fish (after years of failing to do so) because she tried dipping it in cornmeal like they do in Stamps, Arkansas. Will Female Marathons Runners Ever Be Safe? Katherine Switzer. First female Boston Marathon runner. “A big man, a huge man, with bared teeth was set to pounce, and before I could react he grabbed my shoulder and flung me back, screaming, “Get the hell out of my race and give me those numbers!” Then he swiped down my front, trying to rip off my bib number, just as I leapt backward from him. Monika Allen and Tara Baize, LA Marathon runners. They are owners of Glam Runner, which sells running tutus to raise funds for Girls on the Run of San Diego, a non-profit organization nurturing healthy 3rd through 8th grade girls. Monika Allen is brain cancer survivor who recently underwent chemotherapy. 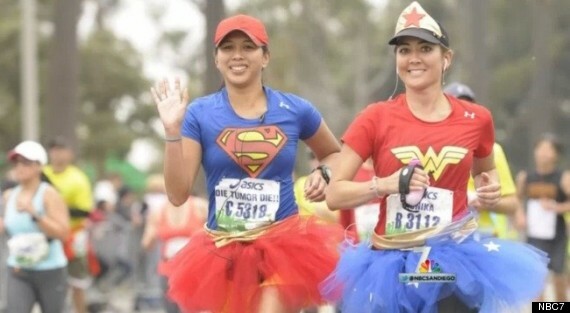 “Monika Allen says she was excited to receive an email from SELF magazine asking for permission to use a photo that showed her running the LA marathon dressed as Wonder Woman and wearing a tutu in an upcoming issue. Note to SELF: Every runner has a story.